10 Best SEO recently revealed the names of the winners of its Best SEO Agency Awards. The top spot in the ranking for April 2017 was granted to WebpageFX. 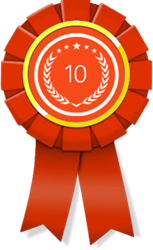 In its latest installment of monthly awards, 10 Best SEO has named WebpageFX as the Best SEO Agency awards for April 2017. 10 Best SEO is an organization made up of online marketing experts that regularly reviews the quality of service provided by various companies in the industry, including SEO firms. They also give awards on a monthly basis to SEO agencies that have stood out by consistently offering quality search engine optimization services at fair prices to all clients. Any business owner or decision maker looking for the best SEO firm for their organization's needs has a high chance of finding it among the list of winners. Following are details about some of the Best SEO Agency Award winners for April 2017. Based in Washington, D.C., WebpageFX is a top SEO agency that aims to provide the best quality and most effective SEO and digital marketing services. They have technical experts on their team that constantly research and test the latest techniques, allowing them to deploy the ones that work the best for their clients. This SEO agency has a solid reputation in the industry, with over 320 positive testimonials received from clients. They can work for any company or organization, no matter what their size or business model is. They have extensive experience generating sales for e-commerce sites, leads for real estate agents and driving highly targeted website visitors. Top SEO firm Higher Visibility is one of the leaders in the world of online advertising. One of their main services consists of helping businesses of all sizes gain prominence in their industry through search engine optimization. They have a comprehensive approach to SEO and digital marketing, ensuring that their clients get higher rankings on Google and Bing. They also ensure better conversions and sales numbers, as well as more positive attention towards their brand in the online world. The SEO team at Higher Visibility has the knowledge and skill to offer local, national or global optimization based on the needs of each client. As one of the best SEO agencies in North America, Boostability has a solid track record of increasing search rankings, visibility and profits for businesses that use their SEO and digital advertising services. They use a powerful keyword analysis and targeting strategy to focus their efforts on the most profitable ones, thus ensuring that a positive ROI comes from the SEO campaigns they manage. For more information about the winners of the award, please visit http://www.10bestseo.com.